The Affordable Care Act has created a system of websites driven to calculate a person's eligibility for Federal Subsidies. (Essentially, Federal Tax breaks to help individuals and families pay for their mandatory health insurance.) This calculation is fairly complex and involves many different factors such as: household size, income, relationships of the people in the household, and the primary address of the applicant. Traditional plots of this eligibility calculation often fall short of capturing the entire picture and certainly do a poor job of showing the data spread based on the factors above. For the purposes of this post, we will focus on "APTC" (Advance Premium Tax Credit) which works like a Federal Tax break individuals and families can use toward paying their insurance. This subsidy is reported to the IRS on the Form 1095 in monthly increments. 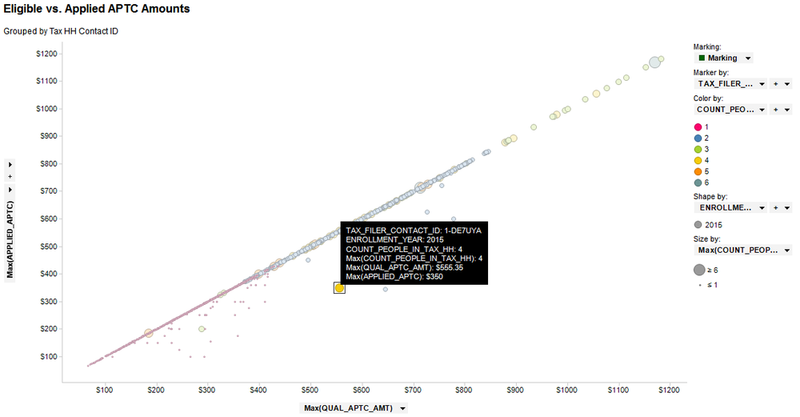 How do we visualize multiple factors and analyze the spread of the results? Can we monitor the results of the calculation for fraudulent or incorrect eligibility determinations? Can we see any trends in the data which would facilitate better communication to citizens on the availability and use of this subsidy? The box plot allows us to chart a range of data according to two factors. Given the multi-factor APTC calculation, we can pick two primary driving inputs and receive a range of Eligible APTC amounts. The really "cool" part about the box plot is we can also use Statistics to derive points which don't fall within the "normal" distribution of the data. We call these points "outliers." Notice the circles outside of the "whiskers?" Those points are the outliers. 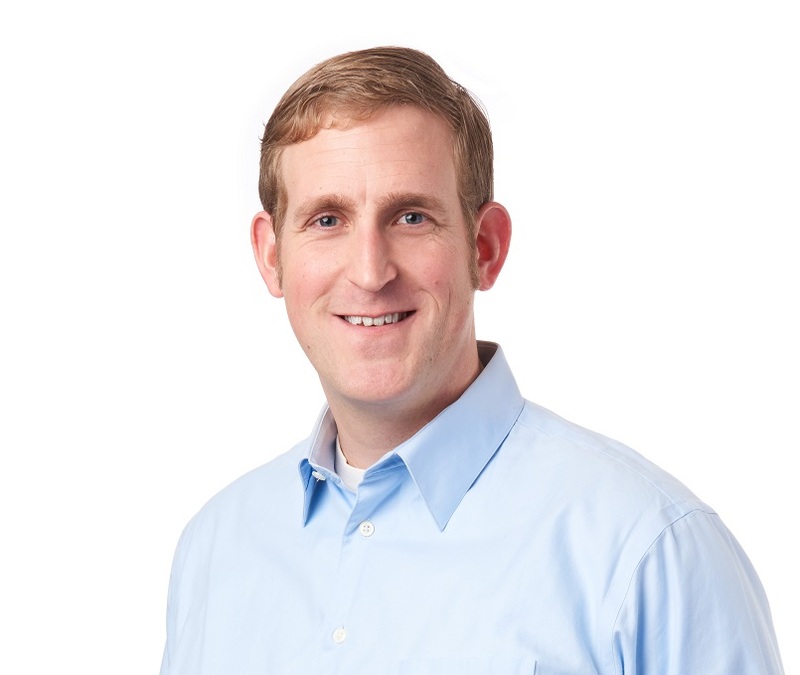 Using our business intelligence tool, we can find those specific application numbers, look them up in the CRM, and confirm if the outlying application is truly an outlier or not. 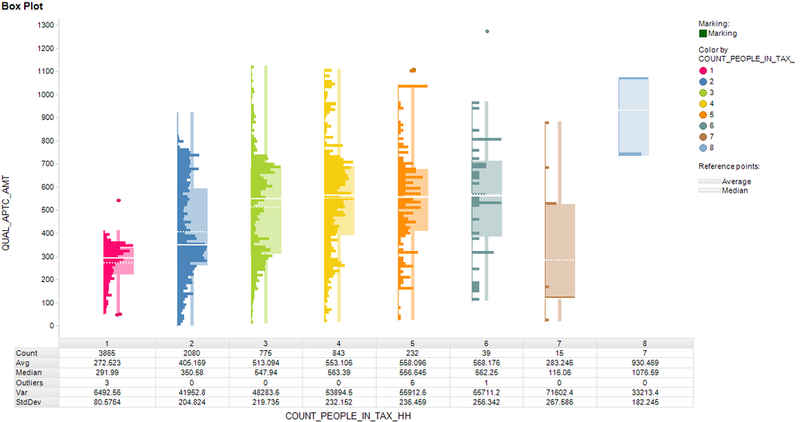 Some additional detail added to the Box Plot showing the distribution within each box. This allows us to see if the results are a normal distribution or skewed to one side of the Median. The outliers have been "jittered" slightly to reveal points which were lying on top of one another. Interesting distributions in some of the Household Sizes, particularly the twin peaks within Household Size = 3. 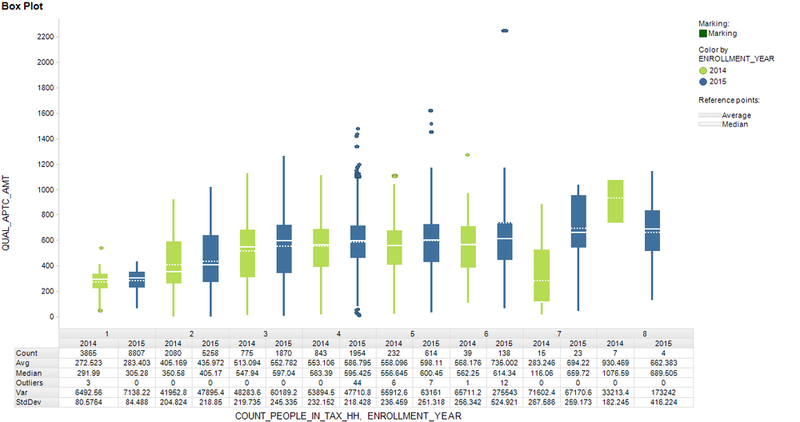 Yes - We can and the Box Plot makes quick work of monitoring APTC results! 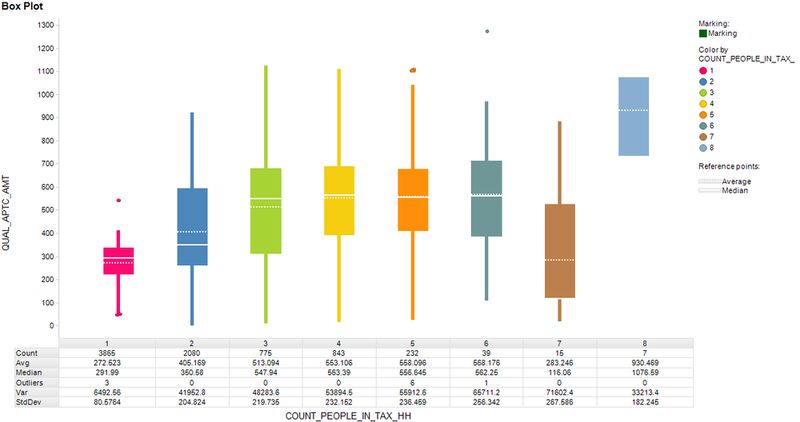 The outliers in the Box Plot show us which applications we need to investigate further. However, additional research is needed into the application to determine if the outlier is due to a system defect, fraudulent entry, or human error on the initial application. The Federal Subsidy has two components: the amount you are eligible to receive AND the amount you actually receive (often called "selected" or "applied.") The Applied APTC does not need to match the Eligible APTC, but often choosing the full eligible amount will be the most beneficial for citizens who need help paying for their health insurance premiums. 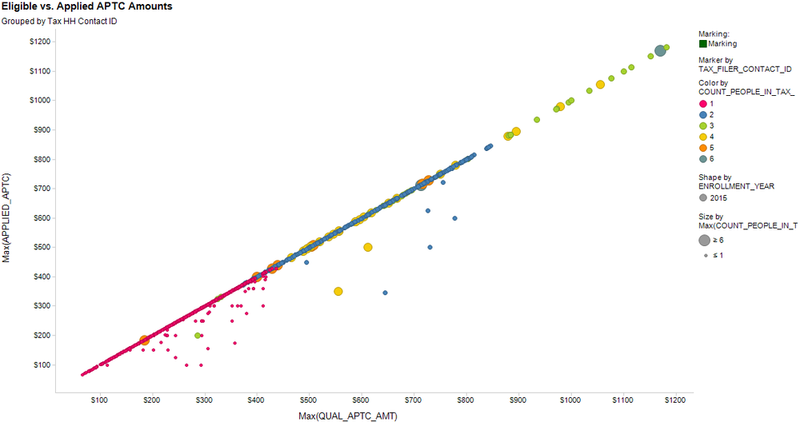 If we change the Box Plot to a Scatter plot and chart eligible "qualified" APTC versus selected "applied" APTC we see a fairly linear trend in the data. As expected, as tax households are eligible for APTC, they choose the full amount to apply to their health insurance plan thus lowering their monthly premiums. However, there are a significant number of households who DO NOT choose the full eligible amount and end up being charted below the linear trend. Households which fall below the linear trend have more APTC available to lower their monthly insurance premium. Increasing the selected APTC to match the eligible amount would be a great way to save money in the monthly budget. * Thus, an outreach and education program to the enrollees could be a positive step for both the health exchange and the households receiving the assistance. *Keep in mind, since APTC acts like a tax credit, these households are not loosing APTC long-term as they should receive a tax return from the federal government for the difference amount between the eligible and selected. 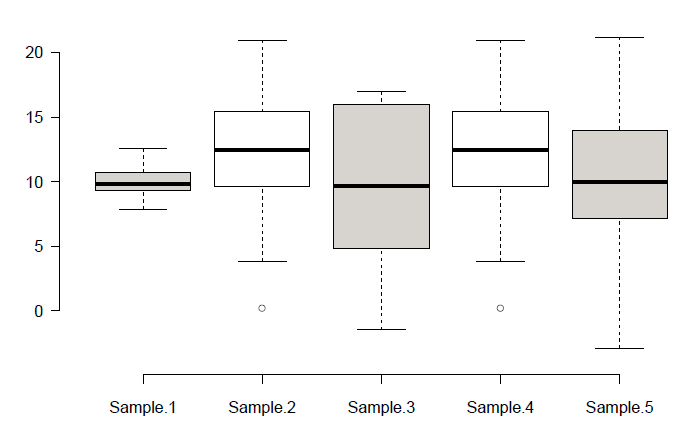 The Box Plot is a valuable tool for comparing data over several factors when a range of data is expected. As demonstrated above, we would expect a range of eligible APTC values for various American households, and the box plot gives us an indication of the data spread and any potential problems in the data. By carefully monitoring for outliers and using additional plots (like the scatter plot) for inspecting data, actions can be taken to positively impact the customer and improve company perception.